Sony has announced that it is to double the annual production of Bravia LCD TVs at its Nitra manufacturing plant in Slovakia from two million to four million by the end of 2008. 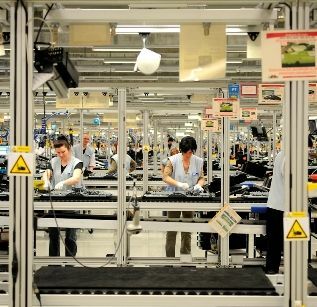 This will make the Nitra factory Sony’s largest single manufacturer of LCD TVs and will necessitate an increase in employees with the creation of 1,200 new positions. "Sales of Bravia are continuing to grow in double-digits in many countries across Europe. It is crucial to strengthen our supply chain from engineering and production to distribution within Europe in order to meet growing demand," said Fujio Nishida, president of Sony Europe. Sony opened its first Slovakian plant in Trnava in 2006. Although the factory quickly reached production capacity it was still unable to meet the huge European demand for LCD and couldn’t be expanded either. In response Sony moved production to the Nitra Technology Centre. In order to increase efficiency, Sony is planning to build a new logistics centre adjacent to the Nitra site. The idea being that Nitra will become the main production and distribution hub for Sony’s pan-European TV business.